Arrival – we’ll await you in the lobby of our home for the week, an elegantly chic and welcoming hotel in Barcelona’s historic center. Join us for an orientation walk of “our” neighborhood in this vibrant ancient seaside city. Settle in to your room, and explore a bit more on your own. An alfresco dinner (included) on Barceloneta beach is our introduction to Catalan cuisine – perhaps a steaming pan of Fideua, Barcelona’s answer to paella? Today we’ll ascend the pinnacles of Montserrat, the serrated mountain northwest of Barcelona. Full of mystery and lore of ages past, this spiritual heart of Catalonia is the home of the celebrated Escolania boys’ choir, founded in the 13th century. We’ll enjoy the sound of their pure voices soaring to the heights of the 16th century basilica after a private tour of the hilltop complex. Take time to enjoy Barcelona on your own before meeting for a Tapas Tasting Tour (included) for dinner. In the afternoon we’ll tour a true palace of music, the lavish Palau de la Musica Catalana. This opulent concert hall is a Modernista garden of delights, every inch covered with astounding detail – and yes, a concert in this magnificent venue is on our itinerary! This evening we’ll enjoy chamber music in a more intimate venue, a peaceful chapel in the Gothic Santa Maria del Pi. From medieval Girona to Dali’s Figueres birthplace, we’ll explore for the day. Our guide will lead us through the beautifully restored medieval heart of Girona with its imposing cathedral, and a labyrinth of vaulted and stepped streets of the Call, the ancient Jewish district. Ready for a surreal contrast? 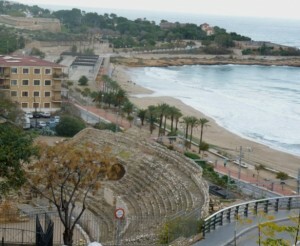 Dali’s Theater- Museum in Figueres holds many of the artist’s iconic works, such as the 3D Mae West face. 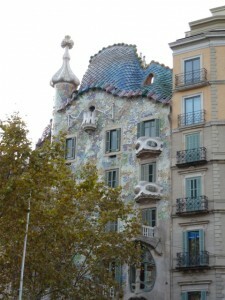 We’ll return to Barcelona in the evening, and stop for dinner (included) near our hotel. 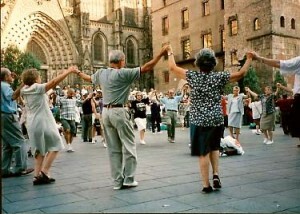 Today we’ll explore Barcelona’s Barri Gotic, Europe’s best-preserved medieval quarter, with a front-row view of the weekly celebration in front of the cathedral as young and old circle to dance the Sardana. Picasso’s presence is felt in a folksy sketch on a facade across from the cathedral, and after lunch we’ll visit the Picasso Museum, appreciating the early work of yet another Catalonia- influenced master. An intimate restaurant in Old Town Barcelona is the place for our Farewell Dinner (included) as we recall together the highlights of our week. Breakfast (included) and hasta la vista to newfound friends before departing.